Exome sequencing in IGE. Heinzen and colleagues performed exome sequencing in 118 IGE patients and 242 controls in order to identify rare variants (defined as present in fewer than 5% of individuals). The 3900 variants selected for follow-up were either associated with IGE or exclusively found in patients with IGE. These variants were genotyped in ~900 IGE patients and ~1800 controls. Their study failed to identify a single variant that was significant on a “genome-wide level”. As many statistical tests are performed simultaneously (multiple testing), the statistical significance is lowered to a level of 10-7 in these studies, as many tests will likely be significant at the 0.05 level by chance. This lowered p-value is then referred to as the genome-wide significance level. Not significant, but possibly interesting. In a secondary analysis, Heinzen and colleagues then looked at the variants that were associated with IGE at a lower significance level and variants exclusively present in cases. For example, a variant in PSME2 was found in 5 unrelated IGE cases, but not in controls. Likewise, the authors found 72 variants that were homozygous only in IGE, but not in controls. None of the genes found in these analyses has any known connection with epilepsy. Also, it is worth noting what the authors did not find: mutations in ion channels genes. Study design of the Heinzen study. Exome sequencing was performed in a screening cohort, followed by large-scale genotyping of almost 4000 risk variants in a second, independent cohort. Goldilocks. The current study aimed to find rare variants that are frequent enough to be detected in approximately 1000 IGE patients in total. It should be pointed out, though, that the authors did not sequence the genes in the follow-up cohort, but only used the rare variants within genes found in the initial sample of ~100 patients. The underlying assumption of such a study is that some genetic variants are present in ~1% of patients and are strong risk factors that are rarely found in controls. These risk factors are predicted by modelling studies and have been named “goldilocks”. Even though the Heinzen study only had modest power to find such variants, the complete absence might tell us something about the genetic architecture of IGE: rare variants with strong effect don’t particularly stand out. It might well be that genetic variants accumulate in specific genes, but few of these variants are recurrent, i.e. found in one than one patient. These findings also underline how incredibly lucky we were to find recurrent microdeletions such as 15q13.3, strong risk factors in the 1% range, which were absent in the Heinzen study. The end of the channelopathy concept? Ion channel genes have gone missing in the study by Heinzen and collaborators. Even though some ion channel genes can be found on the long gene lists of variants exclusively found in cases, network analysis failed to provide a channelopathy signature. Likewise, synaptic proteins including neurexins and neuroligins as found in autism are not overrepresented. It is difficult to interpret this finding. One the one hand, many rare variants are likely to be missed in this study; one the other hand, recurrent single-nucleotide variants in ion channel genes would have had a decent chance to stand out. I am slightly surprised that CACNA1H, EFHC1 and GABRG2 aren’t more prominent. Where to go from here. The study by Heinzen and colleagues is a well-executed and well-written study with a negative result. It is notable that the authors present the data as is and do not try to sell some of their findings as strikingly positive results. Quite in contrast, the authors provide us with some guidance on how to move on. For example, they suggest that future studies may be gene-based, not variant-based in order to capture the heterogeneity of rare variants within a single gene. In line with this, the Supplementary Information provides a list of genes with multiple hits on exome sequencing. Also, larger numbers will undoubtedly help. With increasing sample sizes in international studies, some of the variants reported in the current study may make their transition from candidate genes to genetic risk factors, hopefully helping us understand what happens beneath the surface. 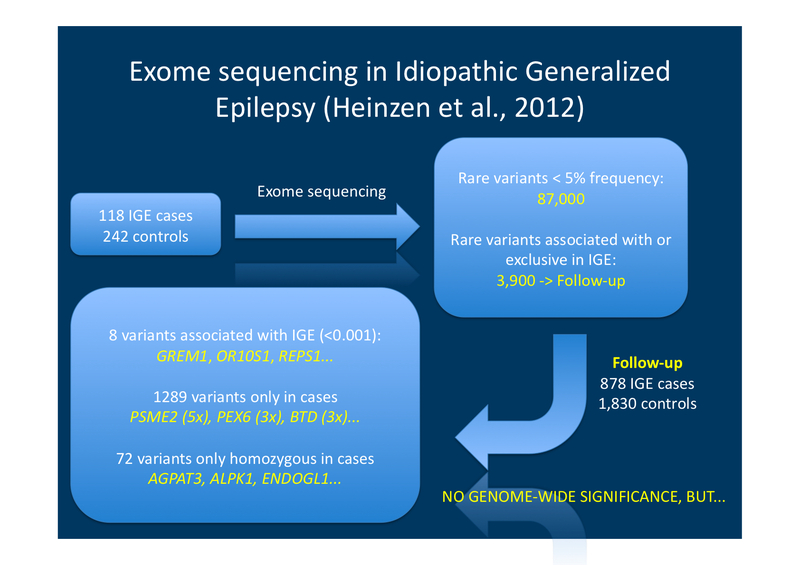 This entry was posted in 2012, IGE/GGE, Papers and tagged epilepsy genetics, exome, genetic architecture, Idiopathic Generalized Epilepsy, IGE, rare variant, significance level. Bookmark the permalink.